Governments in Canada began funding large numbers of non-governmental organizations (NGOs) in the 1960s. Through funding, the state has facilitated the emergence of NGOs across the country and, in some cases, helped create entire networks of organizations. These movements, in turn, have enabled the state’s expansion into new spheres of life such as child rearing (e.g., autism organizations) and personal health (e.g., AIDS groups). Social movement theory has long emphasized the need to document the relationship between the resources available to social movements and the emergence of collective action. This has led several scholars to examine the effect of state funding for a set of movements. Most of this research has been concerned with whether or not state funding leads to activists being coopted and, in the Canadian context, how federal funding for NGOs has contributed to democratic politics or national unity debates. Within activist communities, the role of state funding has been vigorously debated: many have embraced state funding as necessary to the existence of a vibrant social movement sector whereas others are convinced it leads to cooption.The scholarship on state funding for social movements, with few exceptions, has been based on thin empirical evidence. The claim that state funding coopts NGOs, for example, depends largely on anecdotal evidence within specific movement contexts. The more recent scholarship in Canada and the United States has focused on NGOs’ role in the delivery of public services and the impact of state funding on NGOs’ governance structures and organizational practices. Some scholars theorize that funding policy reflects changing state forms: the welfare state emphasizes social rights and situates NGOs as intermediaries between civil society and the state; neoliberalism, in contrast, resists “social investment” and SMOs have been resituated as service providers (rather than as advocates). Political scientists, who have written most of the literature on this topic in Canada, have focused on the state (rather than SMOs) and have been primarily concerned with the federal or Quebec government and more institutional forms of advocacy. Because past studies have concentrated on individual case studies or federal and Quebec policy, we still know very little about the extent of state funding; how it compares among jurisdictions and movements; and how it facilitates social and political change. There is no systematic evidence of if, or in what contexts, state funding helps with the growth of social movements or inhibits activism. And yet this is a critical issue given the essential role that social movements play in a healthy democracy. Our project sought to move beyond past debates surrounding cooption to examine the myriad ways state funding influences collective action. 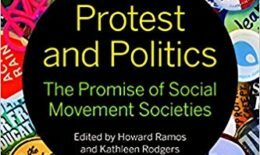 This included drawing on social movement theory to understand how political opportunity, which is the product of a specific historical context, provides incentives for certain types of collective action and, inversely, how social movements shape these opportunities. How does state funding, for instance, legitimize the claims of some social actors to the detriment of others? How do resources influence movement mobilization or shape NGOs’ frames, identities and tactics? State funding might also encourage NGOs that depend on that funding to rely on paid staff, engage in traditional political lobbying, and rarely mobilize their constituents. These tactics have benefits, such as facilitating access to political insiders. However, these more conservative strategies for change may also influence their messages and issues. The recent disappearance of prominent NGOs such as the National Action Committee on the Status of Women has drawn attention to the danger of depending on state funding.The issue is further complicated by NGOs that have adapted and developed successful organizational strategies in response to funding cuts. Community fundraising has the benefit of raising public awareness, albeit at the cost of draining NGOs’ limited resources. We also sought to better understand how political discourse has shifted from citizenship, social rights and national unity to the current focus on using NGOs to reach a diverse array of people through service delivery. We were especially interested in how state funding has fluctuated over time and under what conditions, as well as what government discourses frame these policies and how the state shapes the social movement landscape. These and other issues are examined in detail in the many deliverables that emerged from this project. There are numerous logistical challenges for any single scholar to examine public funding for social movements in a national context because it varies dramatically between regions and across movements. Our project, which was based on a collaboration among several scholars, was unique in that it incorporated historical and contemporary research; considered regional variations and both provincial and federal funding models; compared local and national NGOs; and examined state funding for movements in English and French Canada. It addressed all levels of government, which reflected not only the nature of Canadian federalism, but also the interdependent and diverse nature of state funding for social movements. Most of the scholarship on public funding for nonprofit organizations focuses on organizations that receive the bulk of funding: schools, hospitals, religious organizations, charities, libraries, museums or recreational and athletic associations. More than a third of public funding for the nonprofit sector, for instance, is for hospitals and universities. Almost half the nonprofit sector is dedicated solely to sports and recreation or religion. These studies largely disregard the impact of public funding on sectors such as human rights or the environment. As a result, the scholarship fails to address important questions including the impact of funding on identity-based groups such as women and Aboriginal peoples or whether or not the state funds advocacy among nonprofits. There is also a common theme in the scholarship that presumes that governments have scaled back funding since the 1990s. While this might be true for the broader nonprofit sector, our project demonstrated that some sectors have seen an overall increase in funding.